The Blaster 4WD Truggy is ideal entry level model to discover the exciting world of RC Racing. In the Ishima Racing range there are 4 different models built around a shaft driven 4wd chassis platform. There is a model type for every off road r/c nut. Packed with scale detailing, the Blaster 4WD Stadium Truck is modeled around the popular 1/8th Truggies. It's 1/12th scale sizing makes it look so neat. Underneath the bodyshell you find the factory pre-assembled chassis. 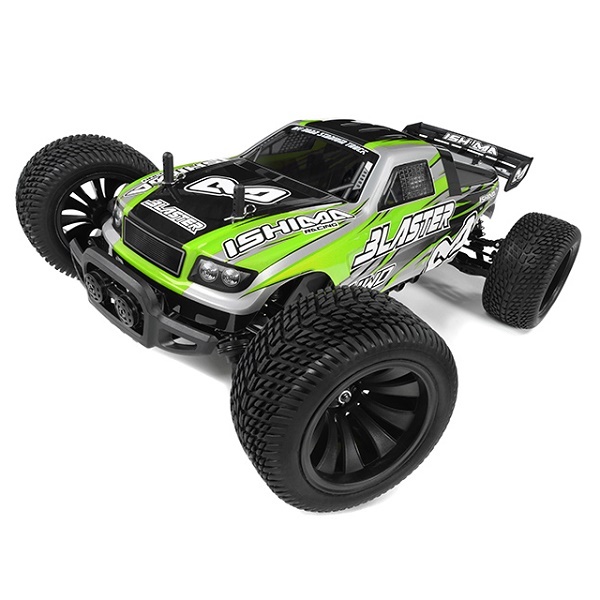 The Blaster 4WD just requires you to charge the supplied Lithium battery and add some AA batteries for the 2.4ghz radio, and you are ready to hit your favorite track or playground. A full ball bearing supported shaft driven 4wd transmission with geared differentials provides a smooth and reliable transmission system. The high quality aluminium oil filled shock absorbers will soak up the bumps and jumps. Battery access is simple via the hinged bottom loading battery cover. The water resistant 3 in 1 speed controller and high torque brushed motor give the Booster 4WD that excellent scale speed of approx 35km/h. There are not many RTR models out there that look much slicker than the Blasster 4WD. The low price, the Blaster 4WD is ideal for first time r/c fans who want more than just a toy grade model. Each model features some superb detailing and custom finished bodyshells. Power and control is provided by a 2.4ghz radio system and electronic speed control, while a Lithium battery powers the brushed motor for excellent scale speed. In addition the ball bearing supported, shaft driven 4wd system and metal oil filled shock absorbers are something not seen on similar vehicles within this price bracket. Others then with toy-grade cars in this price level, all spare parts are available for this model. o Front and rear geared differentials.